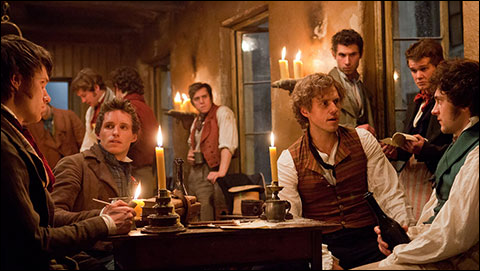 Les Misérables was promoted to be a game changer in the musical genre of film. For the first time ever, the actors portraying the characters would be both acting and singing simultaneously, truly imitating the stage musical from which the film is adapted (not to be confused with the original Victor Hugo novel). I was instantly enticed by this, as well as by the other promotional material, and I disregarded any potential flaws with this method, however obvious they may have been. I dreamed a dream, but alas I was in for a rude awakening. Les Mis tells the story of one Jean Valjean (played by Hugh Jackman), who, after serving a nearly twenty year sentence for selflessly stealing a loaf of bread, breaks his parole to begin a new life. When a young child, Cosette (Amanda Seyfried), is orphaned, he sees caring for her as a chance to make amends for his past sins, and decides to do so even while he is hunted by the ruthless inspector Javert (Russell Crowe), and while the June Rebellion looms in the horizon. The two biggest characters here are obviously Valjean and Javert, both of whom have their own intertwining character arcs throughout the film. There is an assortment of other characters too, some more memorable than others; but ultimately, however interesting they may appear to be on paper, the film fails to make them compelling enough, or give enough time to their characterizations to truly sympathize with them or their situations. To compensate for this, the film panders to the audience, wrenching out any and all emotion they can, mostly through the, admittedly well performed, classic songs (I have to admit that a couple scenes got to me). The reason for the lack of well spent time is the most glaring sin of the film: its ambition. Every scene in Les Misérables is sung. You could count the number of lines spoken normally on a single hand. One may defend this by stating that that is the purpose of a musical, but unfortunately, the movie is strangled by overly indulging in its own genre, while somehow also failing to take advantage of it at the same time. Due to the fact that every line is sung, scenes move along somewhat briskly, and too many lines are expository ones, feeding information to the audience. This is of course one of the cardinal sins of film. Being a visual medium, it is of utmost importance to show, not to tell. However, the film meets another wall here as well. As good as the production value may be, you are rarely, if ever, given a chance to truly appreciate the sets and costumes due to the fact that a good three-fourths of the shots are focused on the primary singer’s face, and little else. Presumably this is due to the fact that the singing is performed live, and so to maintain satisfactory quality, the camera and mike must be near the actor at all times. The limitations here are evident, and the film can be a bore to watch consequently. Les Misérables is an admirable film, because one thing you cannot say about it is that the production team did not try. No one phones in a performance, and the aspirations of the director are clear to see. Alas this is the ultimate folly of the movie. As a musical it fails because it does not take advantage of the liberties that the genre provides. The shots are boring and lifeless rather than extravagant and fantastical, and the characters, who are indeed the heart of this story, are never truly brought to life, leaving the overall film with a whimpering pulse that soon gives out.